Kilby, Rick. Finding the Fountain of Youth: Ponce de Leon and Florida’s Magical Waters . Gainesville: University Press of Florida. 2013. Bibliography, color & b/w photos. ISBN 9780813044873, $14.95. I imagine in some ways we are all searching for the Fountain of Youth. We may want to have the wisdom of being a few years older but for most of us we want to hang on to our youth as long as possible. In his beautifully illustrated book, author Rick Kilby lets us in on the myths and legends surrounding Juan Ponce de Leon, the Fountain of Youth, and how this dream has been, and continues to be, used in marketing. Mr. Kilby points out a common narrative in regards to many of the springs in the state. First is that these sites are sacred to Native Americans who lived near them for years before colonial settlers take up residence near them, drawn by the cool and pure water. As tourism becomes more important to Florida, entrepreneurs such as steamboat owners, begin using the “fountain of youth” myth to draw visitors to the healing waters. With family travel becoming more common these springs were often turned into tourist attractions with highlights such as waterskiing elephants (De Leon Springs), glass bottom boats (Silver Springs), mermaids (Weekie Watchie), and more. In the days of segregation African-Americans could visit locations such as Paradise Park, which was “For colored people only” according to period advertisements. The myth of Juan Ponce de Leon searching for the “fountain of youth” is laid out and addressed thoroughly by Mr. Kilby. Let’s also be honest; how was Ponce supposed to find the real “Fountain” when it seems to have been located in so many places. Florida cities as diverse and far away from each other such as St. Augustine, St. Petersburg, Sarasota County, De Leon Springs, and Venice, have use the “fountain of youth” motif in advertising and promotion. But let us not forget that drinking a glass of Florida orange juice may also be the key to staying young. While this book is fun, enjoyable, and upbeat, there is also a sadness to be recognized when one realizes much of what Mr. Kilby puts forth is no longer available. The interstate system, along with the ease of flying, have put many of these locations out-of-the-way and no longer relevant to today’s visitor to the state. The quaintness of these attractions make them seem outdated and boring when compared to billion dollar theme parks with every bell and whistle imaginable. A cell phone in hand is oftentimes more interesting to not just the young but their parents as well. In addition, the reality is that today’s world is doing considerable damage to springs and our underground water reservoirs. Fertilizers, pesticides, and septic field runoff, have changed many springs from clear and beautiful to overgrown with algae and murky to the eye. Fish, which were often abundant, can be difficult to find in some locations. All is not a lost cause however. Many of the springs are now part of state parks so they have a measure of protection. Many of them are regularly open and can be used for recreational purposes and these are often full of visitors to whom the water seems clear because they do not know better. It will take a large turnabout however to fully save and replenish these natural beauties. We need to look at and address population growth. Further, the use of native plants should be encouraged rather than trying to all have lawns that look like manicured golf courses. Fertilizers and pest control are large problems for our spring systems. Nature is resilient and these wonders can return to their former state if we allow them to. While not a large book this is a book that packs a wallop. It is full of dozens of vintage images including brochures, photos, post cards, and more. There is a retro, or maybe kitsch, vibe here that is quite appealing. The writing is easy to follow and presents a lot of interesting information. Those interested in natural Florida, those interested in the history of tourism in our state, and those with a nostalgic bent, would be wise to pick up a copy of this book and enjoy a couple of hours of reading! You won’t regret it. Rick Kilby is the President of Kilby Creative, a graphic design and advertising firm. You may keep up with Rick by reading his Old Florida blog. Other reviews of University Press of Florida books may be found here. Hessler, James, Wayne Motts, and Steven Stanley. Pickett’s Charge at Gettysburg: A Guide to the Most Famous Attack in American History. El Dorado Hills, CA, Savas Beatie. 2015. Details: 310 pages, index, bibliography, end notes, color and b/w photos, maps. ISBN 9781611212006, $37.95. A reader may ask themselves several questions before making a decision to purchase yet another book on Gettysburg in general and another book on Pickett’s Charge specifically. 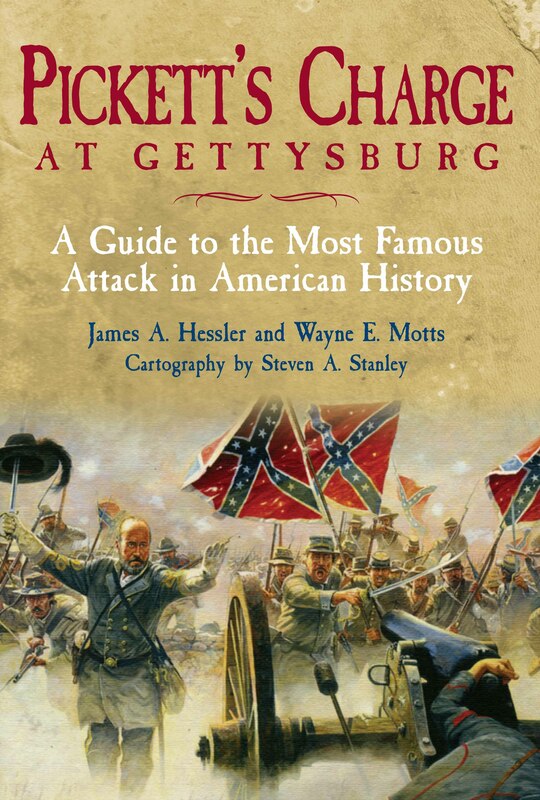 Heck, there are several excellent Day 3 books available including books such as Pickett’s Charge–The Last Attack at Gettysburg (Civil War America) by Earl Hess, Gettysburg, Day Three by Jeffry Wert, and others. Once you take a look at this beauty you won’t be asking yourself any questions. All you will say is Ted Savas has done it again. You will have to have purchase it. Part travel guide and part history this is a book that despite its heft can be used to tour the battlefield The book has the field is divided into four tours for ease of use. Tours include Confederate Battle Line, Pettigrew-Trimble Charge, Pickett’s Charge, and Union Battle Line. Tour stops include full GPS coordinates making it easy to pick and choose should a reader wish to only visit certain locations. Driving directions from stop to stop are included as well. Also included in the book is a full order of battle. The research is thorough, the bibliography is massive and there are nearly twenty pages of end notes. While the end notes take a bit of getting used to due to the numerous, yet informative, sidebars they are complete and a must review for those looking for further information. The book is full of maps and photos, both historic and modern. Authors Hessler and Motts are both Licensed Battlefield Guides, a group who prides itself on strenuous standards and accurate story telling. The maps are beautifully crafted by cartographer Steven Stanley, who is known for his excellent work for the Civil War Trust. This is a book that is highly recommended for any level of student of the battle of Gettysburg. The text is accessible and easy to read. The photos and maps are beautiful to look at. The book itself is sturdy and built to withstand use on the field or look great on a bookshelf. Don’t miss this title. It should be in every Civil War library.